A major Midgard Kickstarter for both 5th Edition and Pathfinder RPG is here! Get the Midgard Campaign Setting in Print—or buy the PDF at DriveThruRPG or Paizo. It’s Pathfinder RPG compatible, but there’s enough system-neutral content to make it worth your gold for any RPG system! Download the free Midgard Preview for Pathfinder, with an overview of Midgard, a ravenfolk PC race and sorcerer bloodline, art and maps, and Midgard fiction! 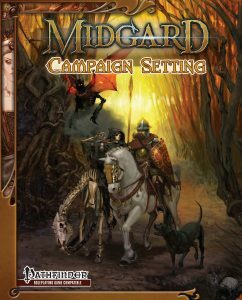 The Midgard Campaign Setting brings to life a world of dark fantasy drawn from the great European traditions. Here you’ll find ley lines and deep magic; the Western Waste’s giant, shambling horrors and magic-blasted landscapes; diabolical gnomes and the schemes of immortal Baba Yaga; wild, wind-riding elves and swashbuckling minotaur corsairs; the Mharoti Empire’s lethal assassins and exotic splendors; and the dragon-haunted crags of the icy Northlands. Ley line magic and the secrets of the shadow roads! Wolfgang Baur is the author of the Kobold Guides to Game Design and the designer of Courts of the Shadow Fey, Kingdom of the Ghouls, Fortress of the Stone Giants, Dark*Matter (with Monte Cook), and many others, including foundational work on Planescape, Al-Qadim, and Zobeck. He has contributed creatures great and small to the D&D canon, from the demon lord Doresain in the D&D cosmology to the Shining Children and others in the recent Bestiary 2. 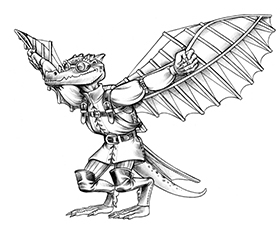 He edited Dragon Magazine and Dungeon Adventures and serves as the publisher of Kobold Quarterly. Baur is the creator and keeper of the flame for the Midgard campaign setting. Jeff Grubb is a legendary world-builder, and has served as one of the co-founders of the Dragonlance and co-creators of the Forgotten Realms campaign settings. He is the author of 15 novels set in the Realms and Dragonlance, StarCraft, WarCraft, Star Wars and Guild Wars. He has written over 30 short stories and essays and over 100 game products of various types and sizes. He likes nothing more than to root around inside a new universe and figures out what makes it tick. He lives in Seattle with his wife and two cats. Brandon Hodge broke into the field as a designer on Halls of the Mountain King, and followed up with the Open Design/Paizo project From Shore to Sea and Sunken Empires. He has contributed to Bestiary 2 for Pathfinder RPG and wrote Pathfinder Adventure Path #48: Shadows of Gallowspire. Hodge lives in Austin, Texas, where he haunts carnivals and flea markets, searching for the parents who abandoned him to the vagaries of the juvenile justice system. Someday he will return to the hobo tribe that raised him.